This article, appearing in Real Clear Politics is so alarming that we chose to post it as soon as we read it. Wikipedia defines "Bullying" as "abusive treatment, the use of force or coercion to affect others, particularly when habitual and involving an imbalance of power." When will Americans tire of media bullying and bias? For some inexplicable reason, some in the media have set themselves up as judges, juries, and executioners of any politician with whom they disagree or dislike. Objective journalism has gone out the window, with their initial obligation to inform the public. Their "target du jour" is Rick Perry. For some reason the media elitists, particularly those on the East Coast have the erroneous belief that their opinion matters more than that of others. Besides the fact that they are thoroughly mistaken it is unprofessional and unethical. American citizens need to wake up and realize that not only do these pseudo intellectuals violate all rules of decency and integrity, but they take the liberty to judge us, the readers, as well as our intelligence and ability to thinks for ourselves. Two Sisters From The Right are convinced that those who read this blog are independent thinkers who can reason, assimilate information and make up their own mind without media deception and power grabbing. GOP consultant Doug MacKinnon says that the editor of a major newspaper told him, "We plan to declare war on Rick Perry and do all in our power to crush him." Mr. MacKinnon was outraged. "No pretense of integrity, professionalism or of unbiased news gathering," he wrote in Investors' Business Daily. But I doubt he was surprised. This is what the "mainstream" media did to Sarah Palin in 2008, and what likely is in store for anyone Republicans nominate. But liberals will go after the Texas governor with special venom because he is anti- intellectual, prays in public, takes the Constitution seriously and sometimes carries a handgun, Walter Shapiro wrote in The New Republic. "It's almost as if Perry's political persona was constructed by bundling together all the fears and phantoms in the left-wing anxiety closet." he said. Some East Coast Republicans share these concerns. Mr. Perry's "primary flaw appears to be a chesty, quick-draw machismo that might be all right for an angry base but wrong for an antsy country," wrote Peggy Noonan in The Wall Street Journal. "He does very well with the alternative reality right," snarked David Brooks, the "conservative" columnist for The New York Times. They were peeved with Gov. Perry for saying it would be "almost treasonous" for Federal Reserve Board Chairman Ben Bernanke to create more money out of thin air. Ms. Noonan has said of President Barack Obama that "he rose with guts and gifts." Mr. Brooks has praised his "superior temperament" and his "perfectly creased pant." Because of their girlish crushes on the president, they are regarded by few conservatives as good judges of character. But Commentary editor John Podhoretz, who is made of sterner stuff, also said "suggesting that Mr. Bernanke's easy money policy was tantamount to treason is the opposite of handling an issue soberly. It's hyperbolic blatherskite." Maybe. But if liberal New York Times columnist Paul Krugman is right (which is about as often as a stopped clock has the correct time), this "blatherskite" performed a valuable service. The Fed chairman foreswore a third round of "quantitative easing" because Gov. Perry intimidated him, Mr. Krugman wrote. Mr. Perry's hyperbole was deliberate, thinks a former communications director for the Texas GOP. "While what Perry said struck some as over the top, it focused all the GOP primary attention on him and pulled the media into covering him, immediately," Bryan Preston said. Liberals often say Republicans are stupid, but they really believe it with regard to Gov. Perry. For liberals, credentials and holding fashionable opinions are more important markers of intelligence than knowledge or accomplishment. "Liberals revere high SAT scores," Mr. Shapiro wrote. Gov. 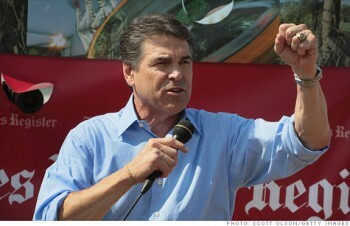 Perry scorns their opinions, and he went to Texas A&M, not Harvard or Yale. So when a new book said his is "the brainiest political operation in America," liberals were shocked. "No candidate has ever presided over a political operation so skeptical of basic campaign tools and so committed to using social-science methods to rigorously test them," former Boston Globe reporter Sasha Issenberg told The New York Times. Washington political consultants cost too much and deliver too little, Mr. Perry thinks. That's why some establishment Republicans oppose him, Mr. MacKinnon said. "For a few in the GOP consultant class, they'll gladly see Perry lose in November just to ensure they are not shut out of a Republican White House." Ms. Palin was a virtual unknown when John McCain selected her as his running mate, so she was easy to smear. Mr. Perry's been governor of the second-largest state for more than a decade, so liberals can't credibly say he's unprepared. And I doubt the president's supporters want to call attention to how his record of job creation compares to Mr. Perry's. So expect lots of name calling. That may not work either. The "Texas cowboy" frightens Eastern liberals, but other Americans may find Gov. Perry's decisiveness a refreshing change from the wimp in the White House who's been described -- cruelly but accurately -- by New Hampshire's Manchester Union Leader as "the Last Responder."